Like everything in life, experience is a plus. Just ask Pedro,Gerardo and Alberto, three young and enthusiastic of the world of wine men,who started this little adventure using all the knowledge in vine growing inherited their grandparents and parents. 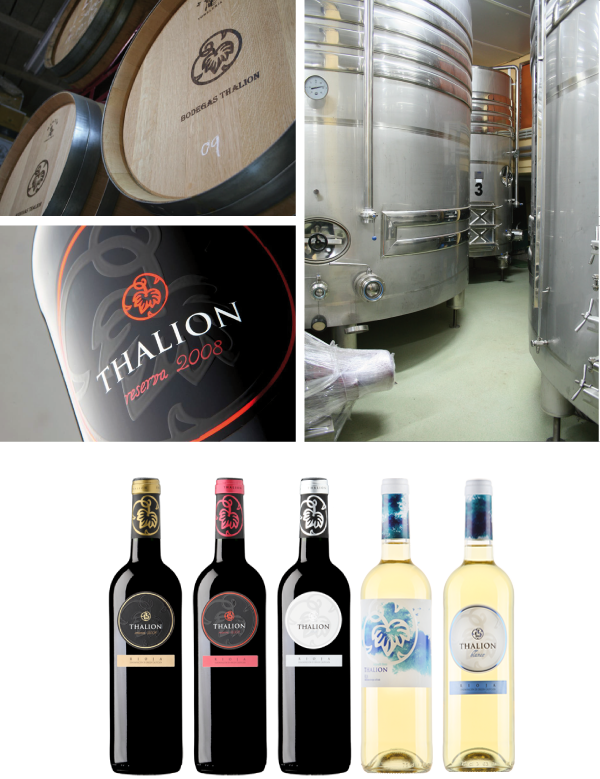 Bodegas Thalion and its 36 hectares of vineyard are located in Fuenmayor,in a exceptional area stretches out next to Ebro river and nestles at the foot of Sierra Cantabria mountains. This privileged land at the foot of Sierra Cantabria mountains(Rioja Alta) is characterized by its clayey and calcareous soils and its extraordinary microclimate.Here is where our forbeards began to grow Tempranillo,Garnacha and Viura grapes. We have inherited the respect and the detailed knowledge of our natural enviroment and our grape varieties. We grow and take care personally of our vineyards.In this way we check that every vineyard have the treatment more suitable.Like this we get the best fruit which we pick by hand when optimum level of ripening is reached.Then we make our wines according to Rioja tradition. This way of take care of soil,along with the incorporation of the latest control systems ensure the highest quality for our grapes. We make our wines only with grapes from our vineyards,some of them have been labeled ecological vineyards. Thus, we convey our passion to our wines which develop a unique personality.They are the reflection of a special land,climate and tradition that make them different owing to their freshness,expressivity and elegance.